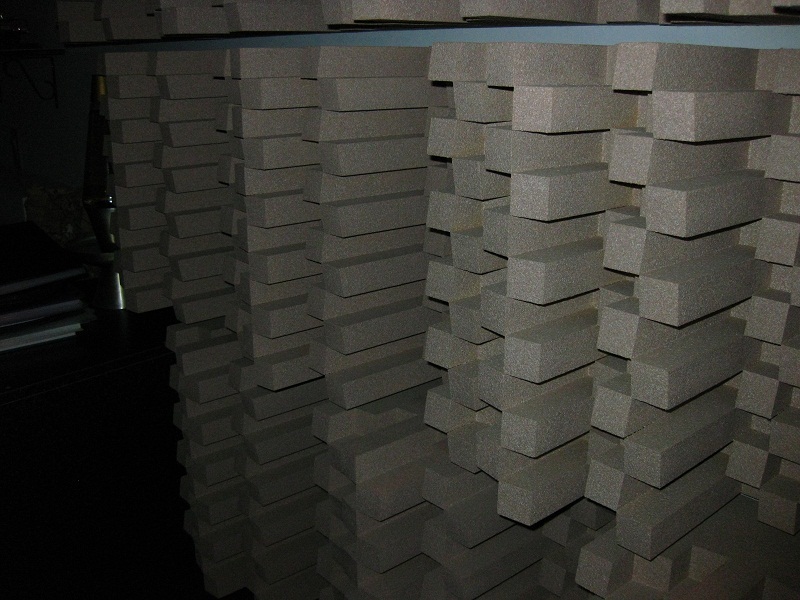 Home Theater Forum and Systems - HomeTheaterShack.com > Home Theater Installation | Systems > Home Audio Acoustics > Show us your diffusers!! Re: Show us your diffusers!! I started off knowing the approximate dimensions of the space I wanted to fill and the approx freq range I wanted to target (the deep combing I observed from REW graphs). I decided since I had a number of 2"by4"s and 2"by8"s laying around I wanted the well width to be 1-1/2". So using QRDude and 1-1/2" as a definite well width, I tried plugging in different numbers to get a close match to the freq range and with a total width that would fill the 5 foot space between my rear speakers. Three prime 11 continuous diffusers seemed to fit the space and the 7-1/2" depth seemed to work with the lumber I had on hand... I just needed to rip them down to size for each of the wells. The freq cutoff range for this design was 369Hz-4526Hz and has a minimum seating distance of 9' 2" so I determined it would work in my theater. Next I bought three 3/16" wood paneling (4'by8' sheets), two 1"X8"X10's to frame around the diffuser, a couple 2"X6"s, decking screws, paneling glue and chaulking. Set up a table saw and an chop saw, jigsaw, and a cordless drill and about 12-hours later I was hauling the finished QRD downstairs. Last edited by monomer; 01-18-10 at 11:02 AM. 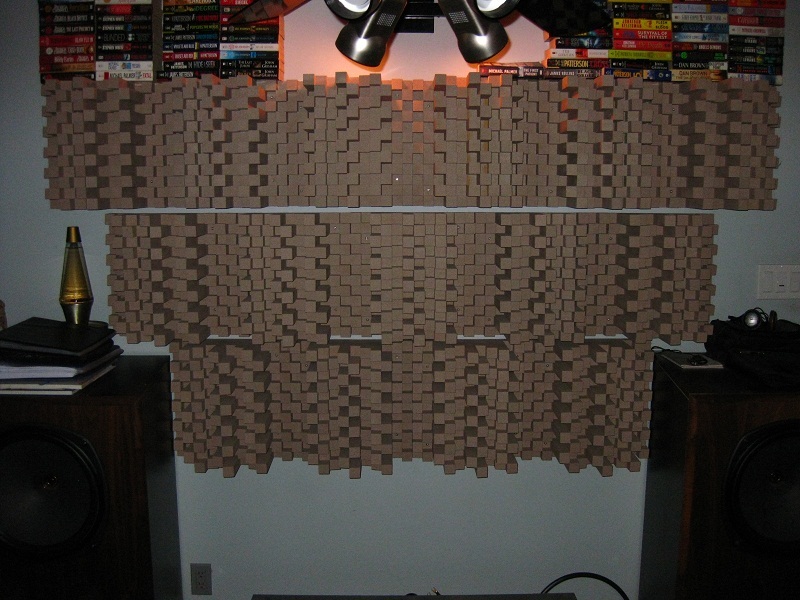 I've made a little progress on my 2D QRD diffusers I'm building for the rear of my Home Theater. I've got the "grid" finished for the first one, and I'm starting to glue in the 814 tiles. I still have one more to go. Yes, I went overboard on this one...but it's one of those "because I can" builds. I'll have more sensible diffusers built up after I get these two monsters done. Awesome... wish I had the tools, workshop, time, money, skill, patience, etc. to do something on that scale. How big is that thing? and how heavy do you estimate it will be when you're finished? and how do you intend to mount it? ceiling? Nice work there... can't wait to see it progress to its completion. Just realized today that the thread of yours I'd been reading was on the other forum (gearslutz). When I tried to register there a couple months ago, I found out someone there was already using my usual name "monomer" (so I had to register there as 'theothermonomer'). I've been using monomer since 1996 and thought it was unique ...until now. As for the big diffuser. It's a Prime 29 (or N29), the tiles are 1" X 1" roughly, and the overall dimensions are about 34" X 34" X 3.5". It currently weighs about 15lbs, but with all the tiles in, I figure it will weigh in about 30 lbs or so. I built it to be light considering many people, for some odd reason, like to build 1D and 2D diffusers with SOLID blocks. Solid blocks are totally unnecessary for the device to scatter as designed. 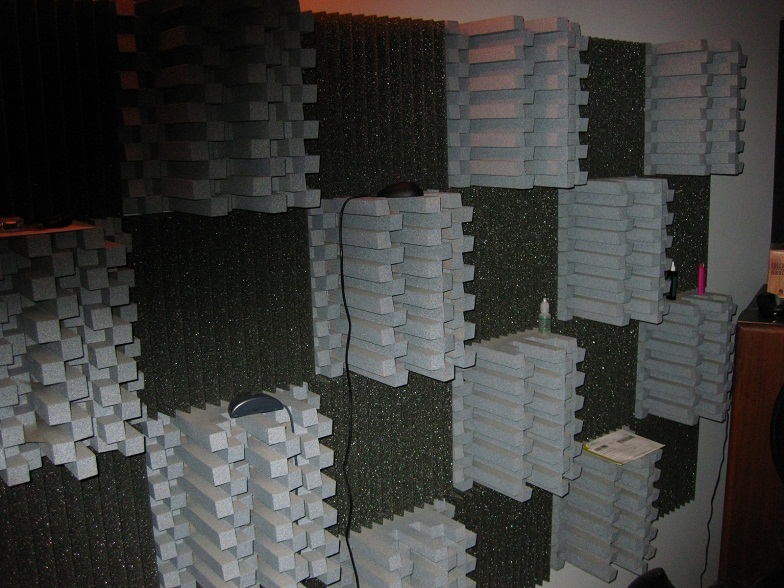 I plan on replacing the 3D wallpaper with these...in fact, the 3D wallpaper is just a place holder and fun/cheap/easy project to enjoy till I finish with these monster 29X29 diffusers. Since I have materials and fins left over, I may make some smaller 2' X 2' from the scraps and reject fins and use them on the ceiling. 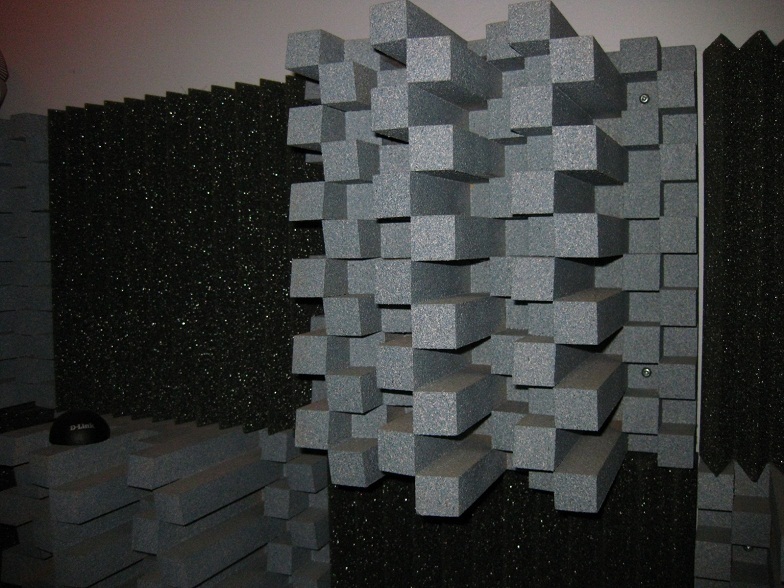 The more I read about acoustic design, the more I'm leaning towards diffuser than absorbers. Talk about DIY! A month of gluing! I had planned just to send the plans for the "omnifusor" to the local EPS workshop and they would cut each row, profile it, and even said they could glue all the rows together. Seriously, if you have a shop that can make these affordable, then go for it! My next set are going to be smaller, easier, and fast to make. Seb, make sure you post your diffusers here when you get them done! I've been away for a long while...haven't been able to do any work on the house or home theater due to health issues and a small electrical fire (don't trust previous owners wiring!!). Anyone else have some diffusers to show off, I could use some inspiration! 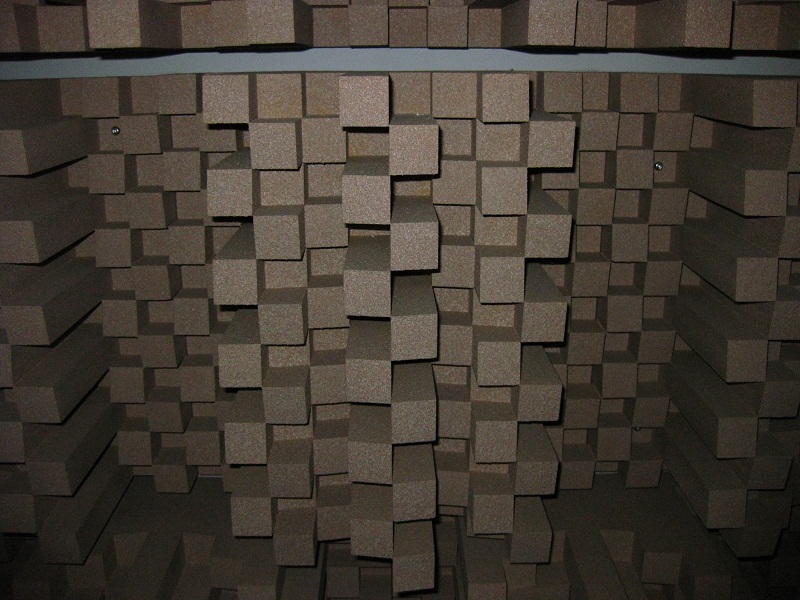 These diffusers are called Art Diffusers. 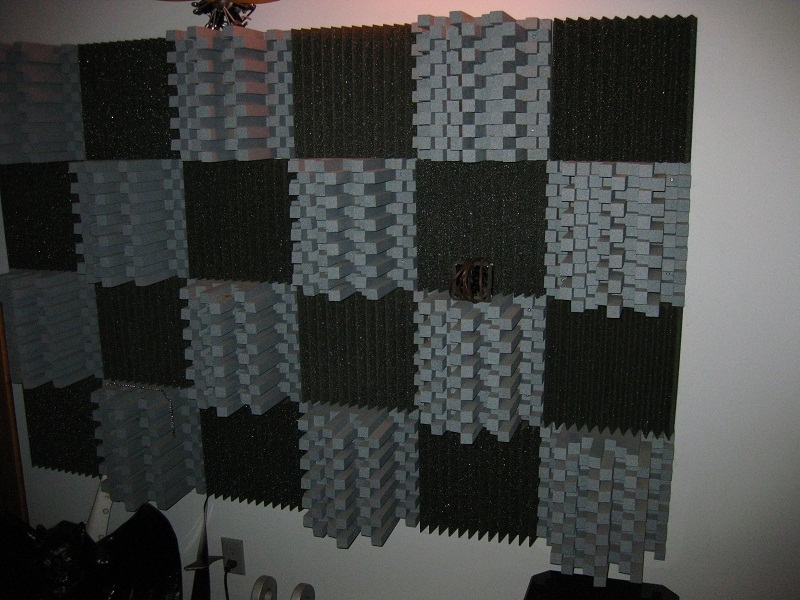 The default size is 15 inches square, but I built the side ones 12 inches square to match the foam tile. I made them out of ranger board and sprayed them with speckle stone paint. I have 38 units for a total of 5472 blocks that were cut to length. I simply just glued them together and took 45 min. to glue one unit. Last edited by krellnut; 04-14-11 at 08:40 AM. What frequencies do they cover? Ranger Board = MDF correct? Is the final product heavy?